It’s July! Independence Day is just around the corner. For those of you in the Mid Atlantic, I hope you survived the heat and regained your electricity by now. In the NY/NJ area we had temperatures in the mid 90s, but nothing like or neighbors a bit to the South. I spent plenty of time at the beach and in the pool, and both were quite refreshing. I provide the recipe below, but as you will see I used a basic sugar cookie. If you already have a favorite sugar cookie recipe or prefer chocolate cookies, you can certainly use whatever you wish. A double yolked egg counts as one egg. That’s right I had a supermarket egg that was “twins”! Apparently this is not all that uncommon if you purchase your eggs at the farmer’s market, but for supermarket eggs they’re usually discovered and removed before hitting the shelves. Not so for me! Making rolled cookies in a hot hot house is very hard. The dough gets too soft almost immediately, requiring a lot of re-chilling time. Once your cookies have cooled, pipe a line around the edge of the cookies. This will serve as a “wall” for the next step. It is best to use either a pastry bag or a squeeze bottle. Wait a few minutes for the border to dry. Then, “flood” the interior with white icing. You can fill the space completely by tipping the cookie or by using an instrument such as the back of a spoon or a toothpick to push the icing into place. In order to do this step, you may need to make the icing a bit more runny. Immediately draw a red and blue bullseye over the white icing. All three colors (red, white, and blue) should be wet – if the icing dries this won’t work. If the icing is too wet the colors will bleed, so don’t over-do it with the water. Next, take a toothpick and drag the icing from the center to the edge. This will create a fireworks (or, as some think, spiderweb) effect. Play around with it, you may come up with your own patterns that are really interesting! If you want to add sugar or sprinkles, now is the easiest time to do it. Allow the icing to dry completely. As you can imagine, this technique is limitless. In my opinion the fireworks pattern is one of the more simple applications and a great way to get your feet wet with marbling icing. Try it, it’s fun! Beat together sugar, butter, milk, vanilla, and egg. Stir in remaining ingredients until well blended. Taking 1/3 of the dough, roll onto a well-floured surface to approx. ¼ inch thick. Cut with cookie cutters. Keep the rest of the dough in the refrigerator in the meantime. Repeat in thirds with the rest of the dough. Any dough that is not being immediately used should be refrigerated. Mix all ingredients until well blended. Divide and color with gel food coloring as desired. 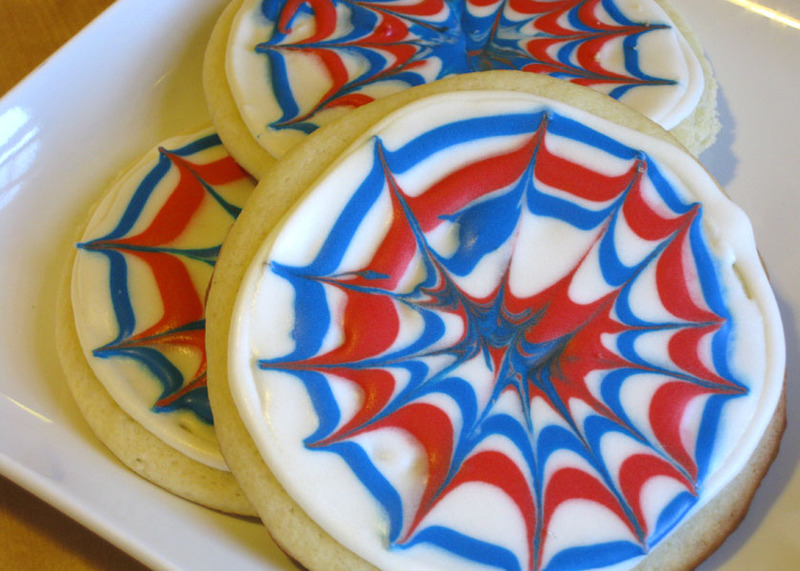 This entry was posted in Baking Jumbles and tagged fourth of july, royal icing, sugar cookies. Bookmark the permalink.